Love Hulten delivers Astovox, packing modern components into retro package | What Hi-Fi? Pioneer speaker drivers inside African mahogany cabinets with brushed aluminium front panels. 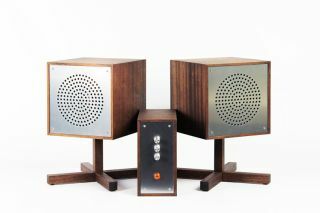 Love Hulten is a man better known for his gaming and computing designs, but now the Swedish designer has turned his retro-meets-modern aesthetic to the hi-fi world. The result is Astovox, a mini hi-fi system oozing retro style. Its cubic speaker cabinets are made of African mahogany with brushed aluminium front panels, and it can be supplied with or removable stands. Inside are two Pioneer TS-D1702R 6.75in drivers with built-in two-way crossover. Thanks to their Aramid/Basalt composite build, they maintain their clarity over a wide audio range - Pioneer claims no compromises in the highs or lows. The speaker wires are secured with gold-plated wire teminals. And the amplifier? It's powered by the Texas Instruments TPA3116 chip with adjustable tone control. As well as a 3.5mm input, you can stream wirelessly via Bluetooth. Prices start at €1400 for a pair of two speakers stands, rising to €2300 for the full system. It'll ship in July/August and is limited to 100 units.